John B. Brown, Chief Yeoman (PA), born March 18, 1916, Graham, TX. He graduated high school and joined the USN Aug. 15, 1939. Military stations included boot training at San Diego NTS, USS West Virginia, Manila Bay and Jacksonville, FL, NAS. During the Japanese attack on Dec. 7, 1941, Brown manned his battle station, which was a phone talker in the gun room of the port gun in turret #2. When ordered to abandon ship, he left the turret, swung over the side and swam to Ford Island, a distance of approximately 100 yards. His brother was also aboard in the powder handling room of turret #3. 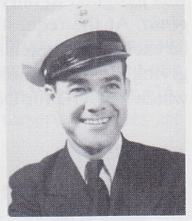 YNC Brown was discharged Oct. 2, 1945. Awards include the Pearl Harbor Medal, eight campaign ribbons and 12 Battle Stars. He and his wife, Madge, have one daughter, Elizabeth and two grandchildren, Angela and Brooks. He retired from Exxon Co. USA, on March 1, 1981. He enjoys basketball and football on television.